What will be built there? How much space will be left open? How big will the park be? The central park space will be about 8 acres including a community center, indoor pool, outdoor “sprayground” and playground, natural amphitheater, stormwater pond, and a “Walking Museum” that tells the history of the site. Are you saving the historic buildings? Yes, we are preserving all of the historic structures that you can see on site, including all 20 sand bins (silos) and all 4 regulator houses. 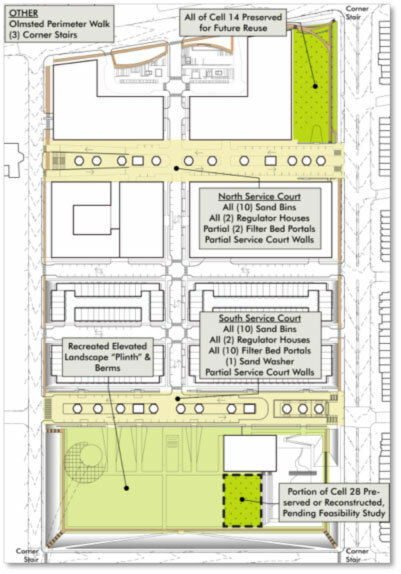 We are also saving many other historic resources including underground filter beds (cells), filter bed portals, the majority of the walls in the South Service Court, the sand washers, many manholes and covers, and the constructed plain and its berms. We are restoring three of the historic corner stairs and the Olmsted Walk around the entire site perimeter. How will you tell the story of the site? We will create a “Walking Museum” that begins with an exhibit space in the Community Center connected to the preserved underground cell in the park. The self-guided walking tour will continue around the site visiting a restored sand bin, regulator house, sand washer, and key points of interest. Will any of the housing be affordable? The buildings will be predominately white with charcoal fenestrations (window frames and bays) and wooden accents. The townhouses will be predominately white brick. The grocery store and apartment buildings will be made of stone and metal. The healthcare facilities will be concrete and white terracotta. The building concept designs submitted to HPRB in October 2013 can be viewed in the Downloadable Reports section of this page. 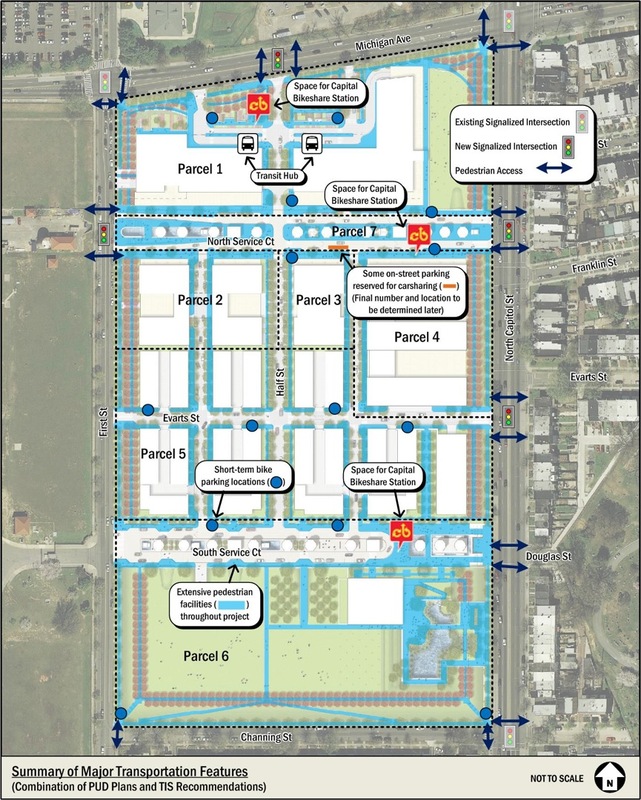 What amenities will there be for existing residents? Will it be environmentally sustainable? Yes, the project is working to be certified Gold for LEED for Neighborhood Development (LEED-ND) by incorporating a variety of Low-Impact Development tools to minimize its negative effects on the environment. These tools include rain gardens, extensive tree cover, gutters with openings to tree pits, pervious pavement, a stormwater pond, green roofing, recycling, and re-using stormwater on-site. See more here. 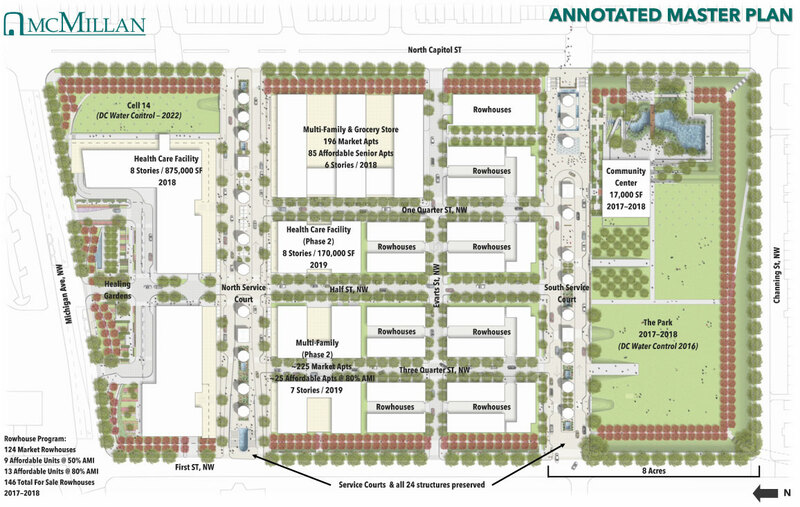 Individual buildings within the PUD site will be certified at least LEED Silver on its Green Communities equivalent. The site will include both new east-west streets and a new north-south street that will reconnect it to the city grid. 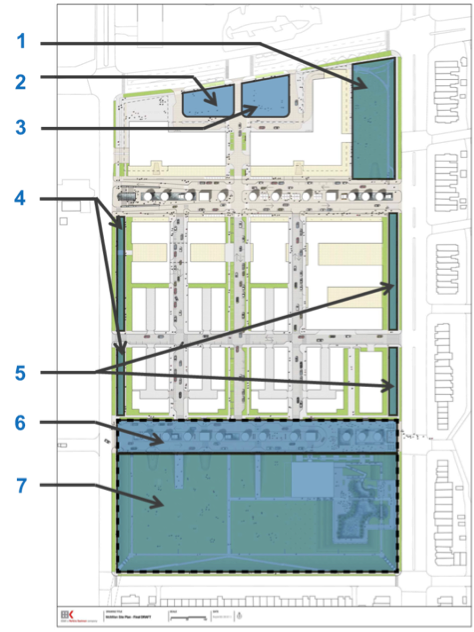 Traffic relief at 1st and Michigan, North Capitol and Michigan, and on Channing as a whole are integral parts of our plan. VMP will build a transit hub near Michigan Ave. as a comfortable, convenient place to access bus, bike, and carshare options. The team will advocate tirelessly for the addition of premium transit options to the neighborhood in an effort to improve the ability to travel to and from the area. 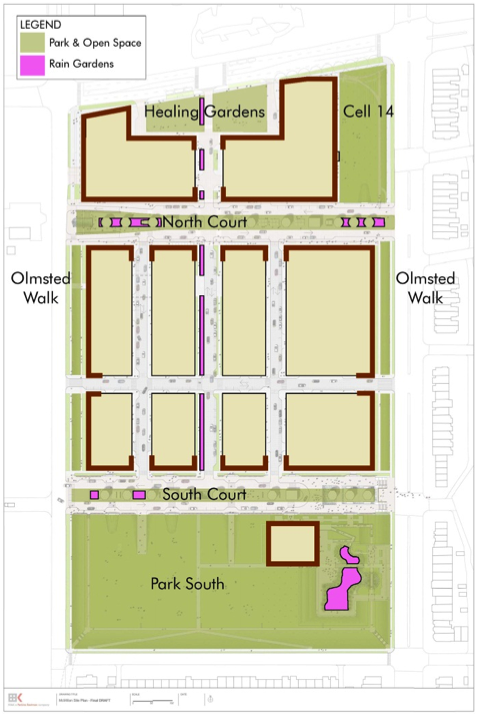 Finally, VMP plans to restore and expand the Olmsted Walk around the site and include hiker-biker trails through the site, improving the overall ability to traverse the entire site. You can read the entire Transportation Impact Study or a five-page summary with diagrams of recommendations. Proposed transit improvements in area include both streetcar and bus services. More information can be found via these links.